Today, my student organization continued its French Week celebrations. The event was my own brain baby, entitled Le Café Français, and it was an hour of coffee and snacks during which people who grew up in a French-speaking country could talk about their lives. 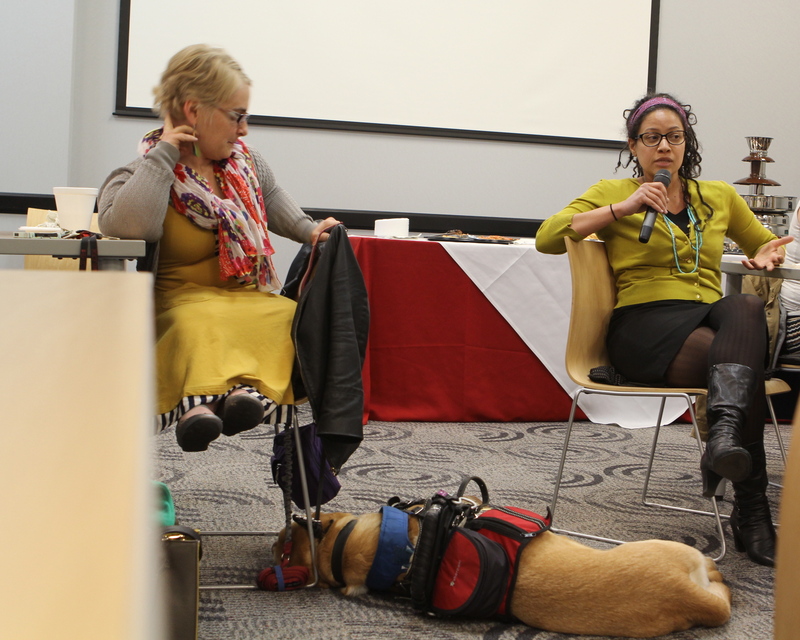 Dr. Amy Allen Sekhar (left) listens as Dr. Sarah Ohmer talks about growing up in rural France. The discussion was even more interesting than I had hoped. It went beyond food and stereotypical French stuff to talk about cultural and linguistic imperialism, racism and injustice. My professor from Cameroon, Dr. Peter Vakunta, is never soft-spoken about these things. He started out the conversation by saying he is culturally schizophrenic, because so many cultures have influenced his life. He also said that France is great, but inequality exists there just like anywhere else. Dr. Sarah Ohmer, whose father is from France and mother from Madagascar, spoke about growing up in the French countryside, then moving to Texas. Living in Texas opened her up to the Spanish language and Latin American culture, which she went on to study in college and now teaches at UIndy. However, she still misses getting baguettes and having time to spend with friends. According to Dr. Amy Allen Sekhar, the only non-native Francophone on the panel, the French identity is in question right now. As people from other countries move in and take up the mantle, it forces those from France to question what it really means to be French. “This story [of post-colonial Africa] and Sarah’s completely picaresque story of traveling everywhere is the modern French story,” she said. Max isn’t properly identified in this caption.